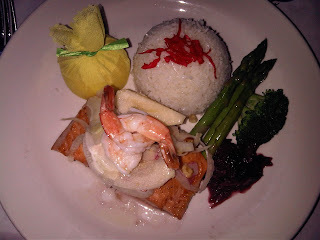 Enjoy Dinner at Songbird Prairie Bed and Breakfast Grilled Salmon and Shrimp with rice and asparagus are sure to please that seafood lover. Or you may be a meat lover, bacon wrapped filet or macadamia encrusted white fish, whatever you choose for your entrees, our chef will expertly prepare and serve you! Dinner for two is $150.00 in the comfort of the Inn. No buttoning up your overcoat when the wind is free... We'll take good care of you! 219-759-4274 Then saunter up to your guestroom and relax with couples massage and slip into the whirlpool with thymes bath salts then wrap yoursleves into our comfy robes. We can have a bottle of sparkling beverage waiting for you to celebrate the two of you! Your chocolate truffles at bedside will satisfy the chocolate lover with smooth fudgy center and candy nest on top. Drift off to sleep and awaken to the smell of Costa Rican special blend of full bodied coffee, sure to please even the most fastidious connoisseur.